Last Wednesday, the U.S. military did something it had not done before, inviting a sizable delegation of local leaders to a secretive $110 million drone base it’s building in Niger. The Nigerien group was led by the governor of the Agadez region, and the visit was the first for many members of the group, which included religious leaders, civil society members, and a handful of journalists, according to a report by a local radio station, Studio Kalangou. The invitations were sent out on Tuesday, just one day before the visit, according to Ibrahim Manzo Diallo, a journalist who participated in the tour. That was just two days after the Intercept published a lengthy investigative articleexploring how the base could be a destabilizing factor for the country, raising military tensions in the Sahara, and that it might even be illegal under the Nigerien constitution. The story noted that the U.S. military had conducted very little outreach to the local community, and that the residents of Agadez had little idea why the base was being built next to their airport and expected little benefit from it, if not harm. Air Force Lt. Col. Brad Harbaugh and the governor of the Agadez region, Sadou Soloké, during a group visit to the base in Agadez, Niger on Feb. 21, 2018. 2017. The visit was held to “to cut short multiple revelations heard here and there about what goes on inside” the base, according to Studio Kalangou. 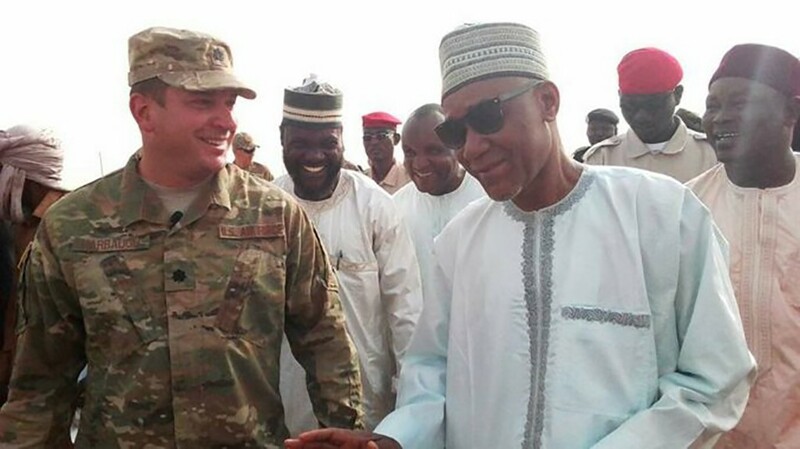 The Agadez newspaper Aïr-Info reported that U.S. soldiers showed the runway under construction, the hanger where Nigerien and American aircraft will be kept, and several structures that house U.S. soldiers who are constructing the base, which is scheduled to open later this year. The base will be the launching pad for armed Reaper drones that are expected to conduct missions over a vast swathe of the Sahara that includes Niger, Libya, Chad, and Mali. In an effort to reassure the Agadez population that the base contributes to the local economy, Lt. Col. Brad Harbaugh of the Air Force’s 435th Air Expeditionary Wing told reporters that the Americans had invested $13 million into purchasing gravel and other construction materials locally, according to Aïr-Info. The Intercept, in its article published on Feb. 18, had revealed that Nigerien workers on the base were paid $1.20 per hour. The Intercept also noted that a variety of conspiracy theories were circulating among ordinary people in Agadez, including speculation that “the Americans were fomenting the terrorists themselves, digging for gold, or they’re after uranium, or oil, or even possibly the natural water aquifer beneath the Sahara.” According to Aïr-Info, Lt. Col. Harbaugh told journalists that the U.S. was not mining for anything. “The proof?” he said. “You’ve seen everything yourself.” The governor of Agadez, Sadou Soloké, told the gathered visitors that “this is a useful piece of infrastructure for us,” according to Studio Kalangou. The gates to the base were not thrown open to everyone. Italian journalists present in Agadez during the visit were refused access, according to a local journalist; the Americans told them the tour was only open to Nigerien nationals. Africa Command, which is the part of the Defense Department that oversees U.S. operations in Africa, denied access to the Intercept last month. It appears that only one American news outlet, CNN, has been allowed on the base since construction began in 2016. Asked via email for comment about last week’s tour, AFRICOM did not respond. The Pulitzer Center on Crisis Reporting contributed funding for Joe Penney’s work in Niger. Top photo: A view from the sky of Agadez, Niger, January 13, 2018. The post U.S. Military Opened Secretive Drone Base to Visitors (After The Intercept Wrote About It) appeared first on The Intercept.